When I was a kid, then as a teenager, my mother was asking me and my sister what to cook for dinner, cos she has no idea … we always was answering in unison CABBAGE. Also my father always was supporting that concept ;-). Even my aunt Irene was complaining that when asked what we would eat, we always answered cabbage :D.
Unfortunately since I met Cookies 0_o I wasn’t able to fulfil my 4th love, cos he doesn’t like cabbage as much. Of course he makes MAGICAL pigs in the blanket, for my Polish friends that would be golabki, and he learned to consume sauerkraut soup (that was not an easy task, believe me! ), but he doesn’t let me cook it that often anymore. Before, I believe we (my parents, and sister) would eat cabbage at least once or even twice a week. 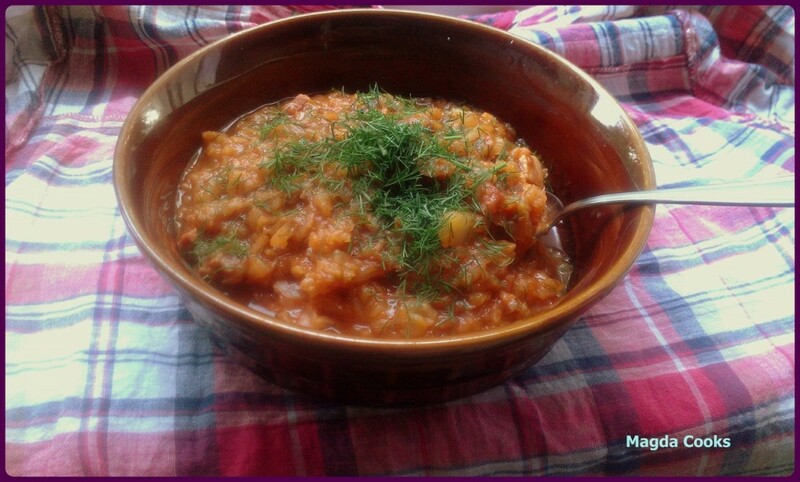 I was happy like a pig in the mud 0_o when he agreed for polish style cabbage cooked with tomatoes. I jumped into the topic as fast as possible. Prepare a big pot with a little water in the bottom and start heating. Get a sharp knife and shred the cabbage, tossing portions into the pot. After you manage to shred the whole head – stir good and cover. Cook for lets say 15 minutes, then add cubed bacon or sausage, minced dill, salt, pepper and pinch of cumin. Boil for another 15-20 min. Add tomato concentrate and skinned and minced fresh tomatoes. Cover and boil for 30 min, stirring now and then. Try, if it’s needed, then add a pinch of yellow poison. As everything with cabbage, this dish is better the next day, but of course also very good right after preparing. Serve with mashed potatoes or fresh bread or even nothing 😉 like I did.